There is increasing focus on long-term survival, function and quality-of-life for trauma patients. There are few studies tracking longitudinal changes in functional outcome over time. The goal of our study was to compare the Glasgow Outcome Scale-Extended (GOSE) at 6 months and 12 months in blunt trauma survivors with an Injury Severity Score (ISS) of more than 15. Using the Singapore National Trauma Registry 2011–2013, patients with 6-month GOSE and 12-month GOSE scores were analysed. Patients were grouped into three categories—those with the same score at 6 months and 12 months, an improvement in score, and a worse score at 12 months. Ordinal regression was used to identify risk factors for improved score. Patients with missing scores at either 6 months or 12 months were excluded. We identified 478 patients: 174 had an improvement in score, 233 stayed the same, and 71 had worse scores at 12 months compared to 6 months. On univariate ordinal regression, the following variables were associated with same or better function at 12-months compared to 6-months: male gender, being employed pre-injury, thoracic Abbreviated Injury Scale (AIS) of 3 or more, anatomical polytrauma (AIS of 3 or more in 2 or more body regions), and road traffic injury mechanism. Older age, low fall, increasing Charlson comorbidity scores, new injury severity score, and head and neck AIS of 3 or more were associated with worse function at 12 months compared to 6 months. ISS and revised trauma score were not significant predictors on univariate or multivariable analysis. On multivariable ordinal regression, motor vehicle mechanism (OR 2.78, 1.51–5.12, p = 0.001) was associated with improved function, while male gender (OR 1.36, 95% CI 1.02–1.82, p = 0.039) predicted improved function at 12 months. Females experience worse functional outcomes at 12 months, potentially due to majority of female injuries being low falls in the elderly. In contrast, motor vehicle injury patients had better functional outcomes at 12 months. Additional interventional strategies for high-risk groups should be explored. Trauma is a cause of chronic morbidity and disability . Trauma survivors may suffer from activity limitations, reduced or inability to work in addition to other participation restrictions [1–4]. Socio-economic consequences are often present [3, 5, 6]. There are several scales that are available to measure quality of life in trauma survivors but few studies have tracked longitudinal changes in functional outcome over time. Glasgow Outcome Scale-Extended (GOSE) is a measure of overall disability, originally used to assess global outcome in traumatic brain injury survivors, and also used for overall outcomes for trauma survivors [7–12]. Recovery trajectories may differ based on patient characteristics and other factors [10, 12–23]. Outcomes have also been known to vary depending on healthcare system [22, 24–27]. Routine registry data can help provide a good reflection of trauma outcomes [8, 11, 23, 28–30]. In Singapore, trauma is the leading cause for hospitalisation, and one of the major causes of mortality . Using the registry information from the Singapore National Trauma Registry, established in 2011, we aimed to evaluate factors associated with improvement in function, measured by change in GOSE score at 12 months post-trauma, for blunt trauma survivors with severe injuries. The secondary aim was to compare the characteristics of responders to non-responders, given that our registry GOSE scores are generally obtained during office hours. A retrospective multi-centre cohort study was conducted using the Singapore National Trauma Registry data. It covered all patients admitted via the emergency department in all public-sector hospitals in Singapore from the year 2011 to 2013, regardless of nationality. Details of the registry data collection and processing have been described [32, 33]. GOSE scoring was conducted using the standardised structured interview via telephone call during office hours by registry officials unrelated to the study as part of the routine registry data collection process. This included indirect methods to interview patient caregivers, as direct interview with all patients was impracticable [13, 34]. The GOSE has been validated for administration via proxy or direct interview with the patient , with no difference when administered via telephone or otherwise [36, 37]. GOSE scoring was either performed face-to-face (if patients were still warded at the acute hospital at the time), or by phone. Consent for the GOSE scoring was obtained prior to proceeding with the scoring questions. The phone numbers were obtained from hospital records, which contain both home and cell phone numbers. In the event that the telephone call did not get through, another attempt was done at a separate time and day, for up to five separate occasions before a “missing” entry made. Retrospective data from January 2011 to December 2013 was extracted. The association between change in GOSE scores and patient, injury, and clinical factors was examined. We included adult patients (age 18 years and older) who sustained blunt injuries based on International Classification of Diseases, ninth revision, diagnostic codes 800–959.9, excluding 905–909.9. As the Singapore NTR only contains GOSE outcome data for patients with at least injury severity score (ISS) of 16, no data was available for those with ISS < 16 . Patients with missing GOSE scores at either timepoint for the primary analysis were also excluded. The primary outcome measure was change in function at 12 months, compared to 6 months post-trauma. We measured and compared the GOSE score at 6 months and 12 months. These were categorised as similar (no change in scores), improved (increased), or worse (decreased) score at 12 months relative to the 6 month score. We extracted patient demographics and injury details (mechanism and severity) from the trauma registry. Patient demographics were age, gender, and pre-injury employment status. Pre-injury employment status was a binary variable defined as “employed” or “unemployed”. Patient comorbidity was measured using the Charlson comorbidity index (CCI) . Injury mechanisms were coded in the registry as motor vehicle accident, fall, interpersonal violence, machinery, tools/objects, sports, unknown and others. We re-categorised injury mechanisms as ‘low fall’ (equivalent to falls from standing, chair or bed), [33, 40] ‘high fall’ (falls from heights greater than 0.5 m) [33, 40], ‘road traffic’ (motor vehicle accident, pedestrian, and motorcycle injuries), and ‘others’. We measured injury severity using the ISS, New Injury Severity Score (NISS) , Revised Trauma Score (RTS) . The pattern of injury was described using an Abbreviated Injury Scale (AIS) score of 3 or greater at each AIS region . Patient characteristics at baseline were summarised by mean (standard deviation), median (inter-quartile range), or frequency (%) as appropriate. Univariate comparisons between change in GOSE scores and predictors of interest was conducted using two-sample t tests or Mann-Whitney tests as appropriate, and chi-square tests, depending on variable type. A multivariable ordinal regression model was fit to analyse patient group differences between those with similar/improved GOSE scores, and those with worse scores. Variables identified as having statistically significant associations (p < 0.05) in the univariate regression were included. Variables not statistically significant but deemed clinically meaningful were also included. For the secondary analysis, we compared patient group differences between those without GOSE scores (non-responders to the registry calls), and those with GOSE scores (responders to registry calls). Univariate analysis using two-sample t tests or chi-square tests was conducted, depending on variable type. Study and data collection protocols and processes were reviewed and approved by the respective hospital institutional review boards. We identified 3013 potentially eligible patients from the registry and excluded 2072 as having no GOSE scores at all/non-responders to the telephone calls. Of the remaining 941 patients meeting the inclusion criteria, we further excluded 18 (1.9%) with missing 6-month GOSE scores and 445 (47.3%) with missing 12-month GOSE scores. Only 478 (50.8%) had complete GOSE scores at both 6-month and 12-month timepoints. Of the 478 patients, compared to their 6-month score, one third had improved GOSE scores (n = 174, 36.4%), and 71 (14.9%) had worse GOSE scores at 12 months. The remainder (n = 233, 48.7%) had similar scores. The mean age was 61.1 years, with males accounting for over two-thirds of the sample (n = 331, 69.2%). Majority were Singapore citizens or permanent residents (n = 418, 87.4%). Less than half were employed prior to their injury event (n = 225, 47.1%). The most common mechanism of injury was from low falls (n = 214, 44.8%). Majority had sustained head and neck injuries (n = 363, 75.9%). Summary statistics are presented in Table 1. Functional outcomes at 12 months compared to 6 months were the same or better for male patients, or those who were employed prior to injury. Certain injuries and patterns were more likely to be associated with improved or similar functional outcomes: motor vehicle mechanism, those with injuries on the chest (AIS 3 or more), or patients with polytrauma (two or more body regions with AIS 3 or more). (Table 2, Fig. 1). Older or higher comorbidity patients had worse functional outcomes. Severity scoring on NISS, head and neck injuries (AIS 3 or more), and injuries arising from low falls were predictors of worse function. Injury scores ISS and RTS, other injury patterns or mechanisms were not significantly associated with functional outcomes. 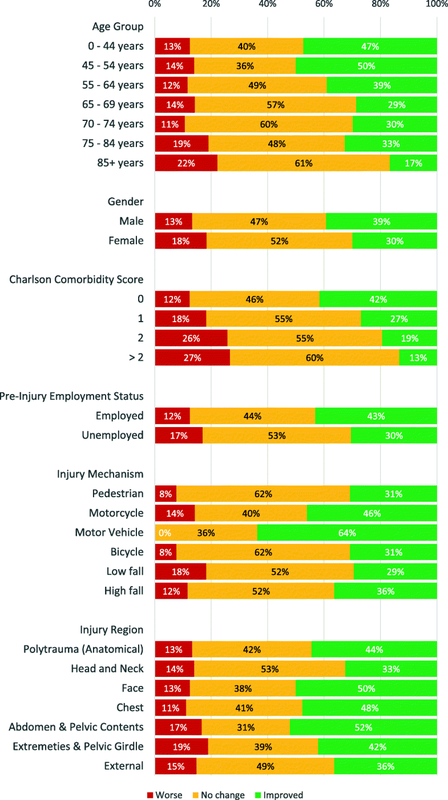 Male gender and injuries caused by motor vehicles were predictors of better outcome. All other variables (age, comorbidity, NISS), despite being significant on univariate analysis, were not significant on multivariable analysis (Table 2, Fig. 1). Our response rate was 31.2% (n = 941), with 2072 non-responders to registry officials’ telephone calls (Table 3). Non-responders tended to be foreign nationals and were younger than responders. Comorbidity scores tended to be lower for non-responders, although injury scores were similar. More non-responders suffered from polytrauma. Our study is the first study of factors associated with functional outcomes in patients with severe blunt trauma injuries in Singapore. Overall improvement rates from 6 to 12 months in our study (36%) were higher than similar studies using trauma registry data in Australia (26%) . Comparison with other studies was difficult due to differences in instruments used to measure functional outcome. Similar to international literature, we found that male gender was associated with improved functional outcomes. This approach was supported by the literature, where the female gender has been identified with worse outcomes [13, 14, 18, 25]. However, this is potentially confounded by age-related injury epidemiology. Majority of male trauma survivors were young and were involved in high-velocity injury but had good outcome. Whereas majority of female injury was associated with age-related falls, thus having worse outcome [33, 43, 44]. Although not statistically significant, patients with older age and higher comorbidity were more likely to experience deterioration in function by 12 months [12–15, 17–19, 25, 45]. This may be related to reduced physiological reserve and frail pre-injury status, thereby negatively affecting recovery. The decline in function in older patients and those with significant comorbidities could be due to natural progression of chronic disease, in addition to the impact of the injury. Intuitively, more severe injuries would lead to worse outcomes. However, we found that trauma survivors with higher NISS, a measure of injury severity, improved better. This is likely to arise from age-related confounder as previously mentioned, and it is supported by previous literature, where long-term outcome (mortality) was not affected by NISS. We found pre-injury employment status to be a significant predictor of improved functional outcomes. We used employment as a proxy for pre-incident functioning and socio-economic status, both of which have been previously found to be positive prognostic factors for functional improvement [6, 12, 14, 18, 20]. However, this is also potentially affected by age. We found similar relationship patterns between anatomical injuries and functional outcomes . Patients with head and neck injuries had worse outcomes, ostensibly due to concomitant spinal cord or central nervous system injury. This highlights the importance of preventive or protective strategies. Polytrauma patients were also found to experience functional improvement over time, possibly representing patients with high-velocity polytrauma requiring longer recovery time but with good rehabilitation potential. This may also explain our findings in relation to NISS and gender. Our study also described the real-world functional outcome registry experience if majority of staff force made the calls during office hours. Our response rate at 12 months was lower than that of other countries (US 42%, UK 43%, Hong Kong 59%, and Australia 85.8%) [28, 30, 45, 46]. Younger patients and foreign nationals were more likely to be non-responders . We postulate that younger patients were more likely to have recovered and returned to daily activity, hence not responding to the calls . Foreign nationals may have departed the country, thereby also not responding. Conversely, patients with low falls were more likely to respond. This may be due to the fact that low falls occur more commonly in older patients who are more likely to be available during office hours or who have companions with them to answer calls. This is similar to what the Victoria State Trauma registry experienced, where the older or institutional patients tended to be captured during office hours interviews, while younger and working adults tended to be non-responders during office hours as they were working and therefore unavailable . Our study was limited to trauma registry data, representing only hospitalised patients. However, as our focus was on severe injuries, we expect the majority if not all such cases to require inpatient care. Our study was able to cover all public-sector institutions nationwide, accounting for 80% of all hospital-based care in an urban multi-ethnic population. We also had issues of responder bias, where patients lacked GOSE scores at later timepoints. Nevertheless, we were able to demonstrate target groups for intervention in order to improve functional outcomes and recovery trajectories. Future studies should focus on longer-term follow-up as recovery processes may extend beyond 12 months, and on interventional strategies, such as our recent study showing that patients discharged to inpatient rehabilitation services were less likely to be readmitted . Females experience worse functional outcomes at 12 months, potentially due to majority of female injuries being low falls in the elderly. In contrast, motor vehicle injury patients had better functional outcomes at 12 months. Additional interventional strategies for high-risk groups should be explored . The authors would like to thank the National Trauma Committee, the National Trauma Registry working group, the National Trauma Unit, the trauma database coordinators, and colleagues at the National Registry of Diseases Office for maintaining the NTR. The collection and management of data for the National Trauma Registry is funded by the Ministry of Health, Singapore. The authors received no specific individual funding for this work. The collection and management of data for the National Trauma Registry is funded by the Ministry of Health, Singapore. The data was obtained from a third party, the National Trauma Registry, established by Singapore’s Ministry of Health. Data are available from the National Registry of Diseases Office in Singapore for researchers who meet the criteria for access to confidential data. Details are available at https://www.nrdo.gov.sg/data-request/faq. THW conceived and designed the study. THW and NN performed the data analysis. ALT drafted the initial manuscript with all authors contributing substantially to the final manuscript. All authors read and approved the final manuscript. THW takes responsibility for the paper as a whole. Ethical approval was given by the first author’s (Singapore General Hospital) Institutional Review Board and all data was de-identified and analysed on password-protected computers. Consent was not obtained because information was anonymized and de-identified prior to analysis as per National Registry of Diseases Office protocol. Wong TH, Wong YJ, Lau ZY, Nadkarni N, Lim GH, Seow DCC, et al. Not all falls are equal: risk factors for unplanned readmission in older patients after moderate and severe injury—a National Cohort Study. J Am Med Dir Assoc. 2018. https://doi.org/10.1016/j.jamda.2018.08.006.